The UN headquarters in New York lit up with the word ‘Yoga’ for International Yoga Day 2017. This is the second consecutive year that the UN headquarters is celebrating the event. Over 180 countries will participate in International Yoga Day 2017, being celebrated on Wednesday June 21, 2017. Param Institute of Education sponsored & celebrated International Yoga Event with large gatherings, on Saturday, June 17, 2017 at Param Adult Day Care Center, 60 E Hanover Ave. Morris Plains. Since the establishment, everyday Param Institute of Education is achieving the new milestone in the path towards its noble mission based goal of imparting the highest quality education, with the state of art professional skills, to every student individually. Our vision is to ensure that each and every alumni of PIE not only can compete with the marching world but must stood ahead in his/her excellent career of healthcare industry or specialized technical fields. PIE believes that in a busy and divisive world YOGA can be done anywhere, anytime. During welcome speech, Mr. Vipul Amin-President of Param Group of Company explained that human body is just not physical body but has mind, intelligence, emotion, instinct, intuition. And holistic health is a diverse field by which many technics and therapies including yoga are used to treat person as whole unlike the different part in modern system of medicine. 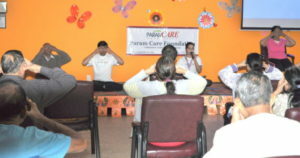 People learned and practiced various poses of yoga-mudras they enjoyed about two hours of yoga sessions with yoga expert and thanked Param Institute of Education for doing very useful events for the wellbeing of the community.